When I started writing this post, I had no idea how appropriate it would be. Initially, this was going to be your basic “how to keep meals balanced while in a relationship” especially if you’re trying to stay healthy. WELL, as of December 16th I will have to create his and hers meals for the rest of my life! I’m getting married to my best friend, my partner in crime, my better half, my puzzle piece, my soul mate. I’m OVER THE MOON! It was a special surprise proposal; he really did his best to throw me off cause I’m very sneaky and curious! I always joke that I got a bachelor’s in Nosiness (or Journalism if you prefer) And I’m a VERY hard person to surprise! It’s been well documented that while in relationships, women tend to gain weight. And I’m sure there are many women who can attest to this fact! Myself included! 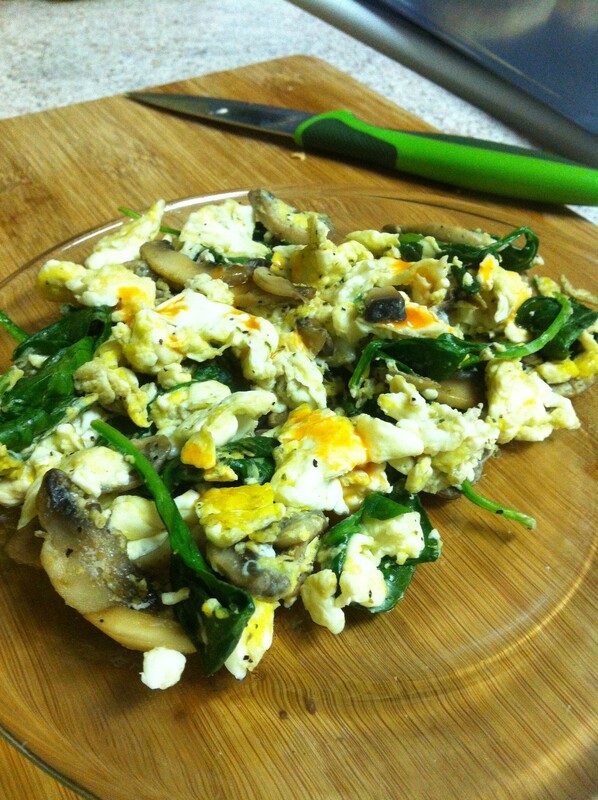 One of the hardest things to do is create a meal that is healthy, delicious and nutritious! Especially when you have to make something that appeals to someone with VERY different taste buds. I’m totally happy munching on nothing but vegetables, whereas Military Man would not be happy crunching on cauliflower and cauliflower alone. So how do you transition your significant other to eating healthier foods and, by proxy, keep your own health in check? Military Man loves Italian food so I’ve been making the switch from white pasta to whole grain and veggie pasta. The taste difference is minute. Now there are different pasta sauces out there that contain a “hidden” serving of vegetables, and they taste just as good as the regular non-veggie sneaking sauce. Plus Low Fat Ricotta Cheese is all the flavor with half the calories and fat! If you’re in a relationship, do your eating habits match up with your significant other’s? If you’re single, how do you create a menu for dinner guests? As I’ve mentioned before, I’m in my senior year of college. I’m taking 18 credit hours and I also work part time. I’m really, really busy, to put it lightly. I don’t like to complain though, because I know there are plenty of people who have even more on their plate than I do. My brother who’s also a senior (no we’re not twins…it’s a long story) recently battled strep and mono for approximately a month, and he’s a pre-med student. My best friend once took 21 credit hours in one semester while working, and my mom has two kids, two dogs, four elderly parents, and a house to take care of. But let’s be honest, when you do homework every single night and you’re still barely keeping up, it gets discouraging. I’m muddling through though, because all this hard work now is going to allow me to pursue my passion (more on that at a later date). So how do I manage to keep up with everything, other than organization and self-discipline? Having a ton of energy is my secret. Thankfully, all of my classes start at 11 a.m., so I don’t have to get up early. But when you’re not getting to bed until 1 a.m. or later because you didn’t even finish all your homework until midnight, even getting up at 9 a.m. is difficult. Of course, if you’re going to need plenty of energy to get through the day, breakfast is essential. But forget getting up in enough time to shower, get ready for school, make, and eat breakfast before I have to leave. I’ve tried meal-replacement bars and shakes because they’re fast and portable, but they usually don’t taste that great and I’m hungry again in an hour. Enter smoothies. They’re delicious, healthy, portable, and filling. Best of all, they give me tons of energy. I don’t find myself in a mid-day slump anymore and even though I’m tired when my alarm goes off, once I get up and moving, I’m good to go. 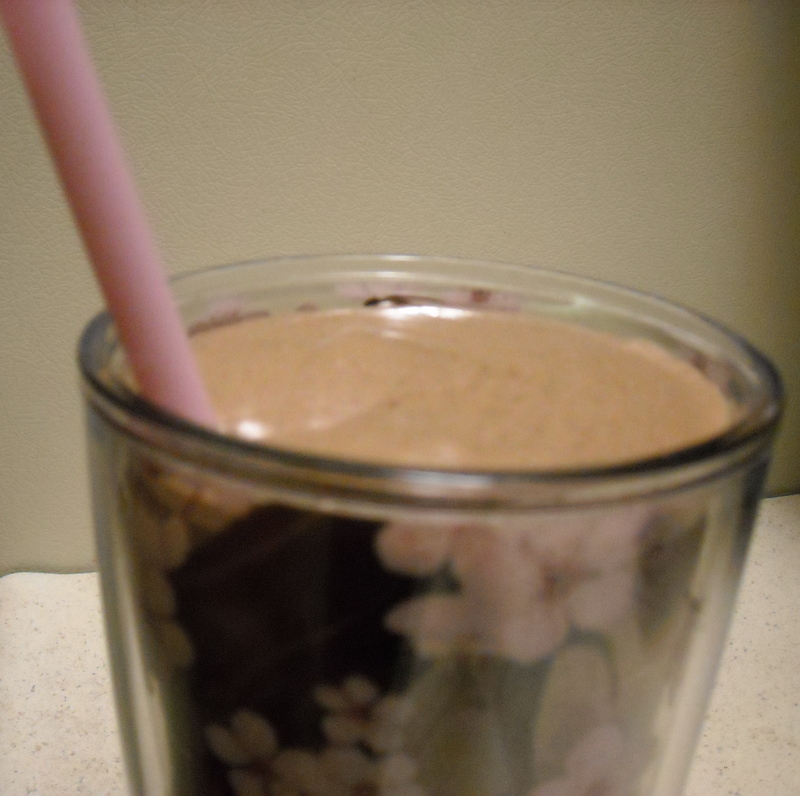 I talked about smoothies briefly in my post about how I started making the transition to healthier eating. But I wanted to write a post specifically about smoothies. And I didn’t share any actual recipes in my other post. So here are my three favorite smoothie recipes. Don’t judge them until you try them, they’re all healthy and they’re all delicious. I promise! Question of the night: Do you like making smoothies at home? What’s your favorite recipe? Happy Monday everyone! No…Not so happy? LOL. Personally, I kind of look forward to Mondays because I work all weekend long and I’d much rather be in class than at work. But that’s just because I hate my job, I’ll definitely be ready to be done with school when I graduate in May. Anyway…enough rambling. Tonight I have a recipe for you all that’s crazy easy, healthy, and-most importantly- delicious! I haven’t made it in quite awhile, but I was hit with a craving for it today. It’s a recipe I got from my mom and I’m pretty sure she made it up. 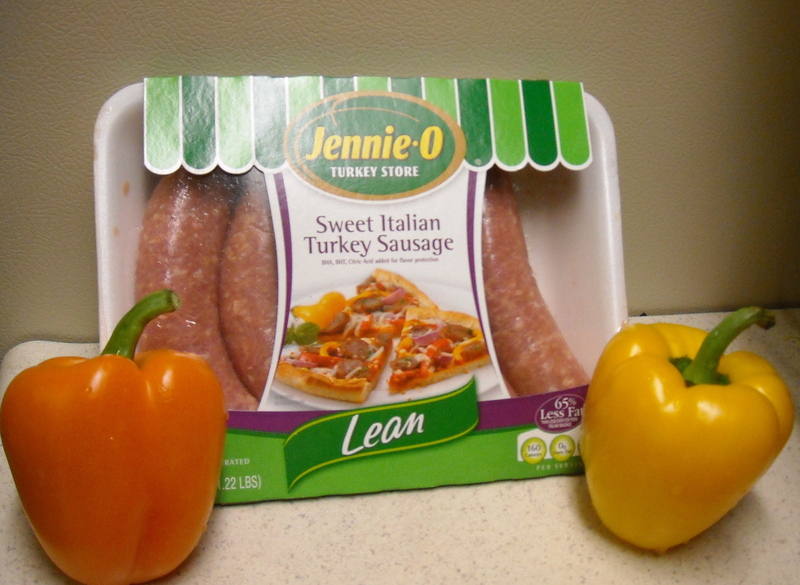 If you’re craving Italian, this is a great way to satisfy that craving without all the carbs. Also, in addition to minimal prep work, the two main ingredients can be cooked with very little supervision. So you can be working on something else (or reading a good book) while dinner is cooking. Which, in my opinion, is one of the best things about this recipe! …Seriously, that’s all you need! 3. 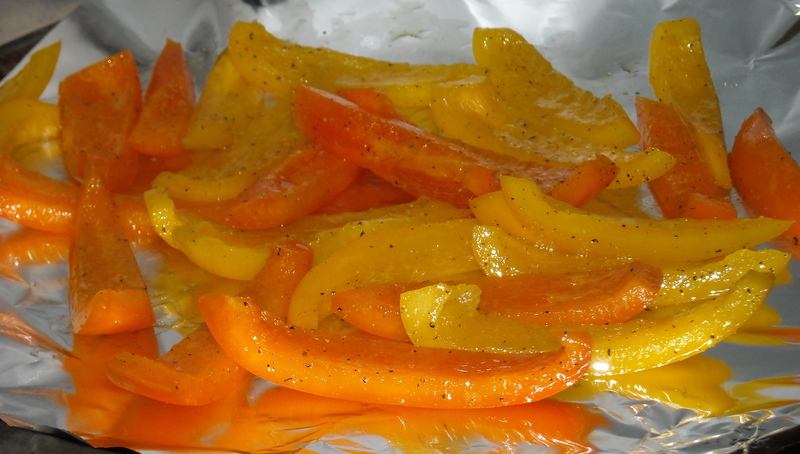 Spread peppers evenly on a foil covered cookie sheet and roast in the oven. the longer they roast, the sweeter they’ll be. So unless they’re burning (I’ve never had this happen) let them roast until you’re too hungry to wait any longer or the edges start to blacken, whichever comes first. 7. 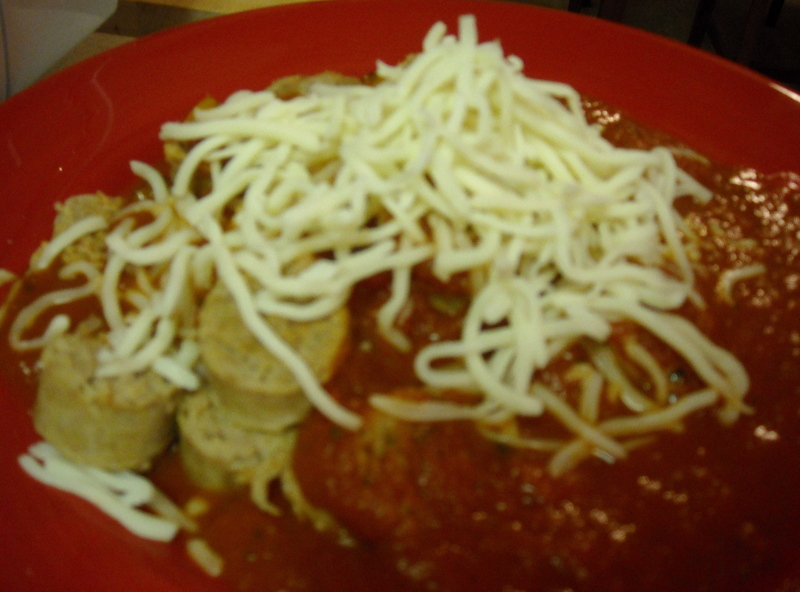 Once everything done, pour marinara sauce over peppers and sausage and top with a little mozzarella cheese if desired (FYI, this dish won’t be quite as healthy if you use a ton of cheese). Now that I’m EMPLOYED(!!!!! ), I get to make healthy lunches every day. I have some requirements for any lunch, it has to be portable, delicious and filling. I want a lunch that I’m excited to eat. If you pack yourself a good, quality lunch, you’ll be less likely to hit up the vending machine or scrap the whole thing for fast food. When it comes to midday meals I prefer a bigger lunch and a smaller dinner. In my excitement of being employed again I decided to prep my lunch for Monday. Great Sides/Snacks: potato salad, almonds, crackers, hummus (with cracker or veggies), celery and PB, baked chips, popcorn (with assorted toppings, Salt, butter, chocolate chips, nutritional yeast), rice, pudding cups, trail mix, granola bar, any fruit or veggie!! Mondays are usually the bain of the workweek, but a delicious and filling lunch can make any Monday brighter! I’m looking forward to a delicious Tuna Salad! I love tuna because it can be made in SO many ways. I like my tuna salad with lots of flavor and crunch! Definitely not your traditional tuna salad. Mix it well and add a TB of mustard. The mustard gives it a nice kick and makes up for the lack of relish. 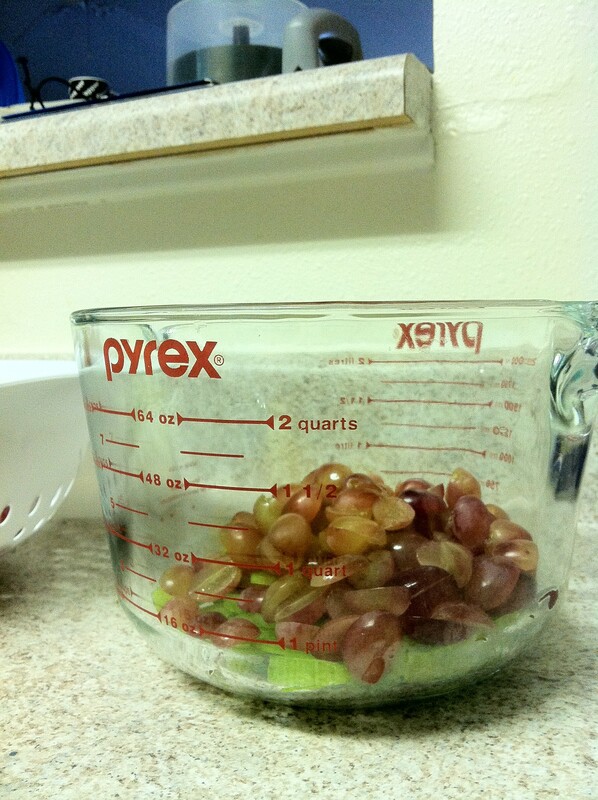 The celery adds a great crunch, and the grapes add a burst of sweetness. If you are hesitant to stray from your standard Tuna Salad recipe, this is a great “gateway” recipe. I’ve got another Tuna Salad recipe that involves honey and cinnamon…..but that’s another fish for another day! 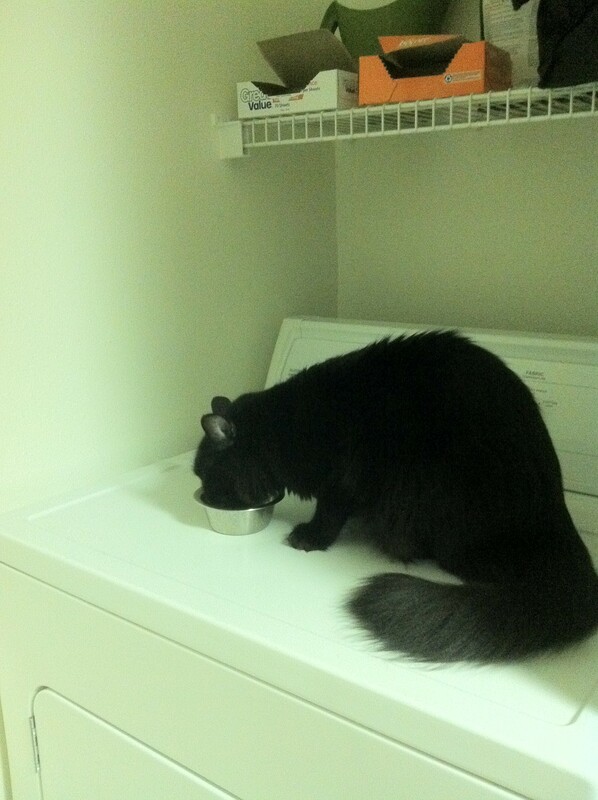 Wondering what to do with the tuna water? I don’t even know if crock pots were around in the 70s…but for some reason, to me, that is the era they bring to mind. Now I wouldn’t be me if I didn’t spend my day googling different crock pots and , by proxy, recipes. I’ll be the first to admit, I can be a bit paranoid. I keep a sticky note over my laptop camera so “they” can’t see me. I worry about Glade plug ins causing fires (oddly enough I never worry about candles, cause I have never left one burning) and I have to unplug the Glade air fresheners when I leave. And now I worry about crock pots going crazy. Despite the fact that I have successfully used a Crock Pot before, I still worry. Logically, I know this fear is irrational. If you do your research and read all of the reviews and reports before you make your Crock Pot purchase…all should be well. Besides, most people leave toasters, microwaves and blenders plugged in when not in use. Crock Pots are designed specifically with that purpose in mind; to do the work while you’re AWAY. And the fact that I’ve even made food successfully, in a Crock Pot, just proves my paranoia wrong. 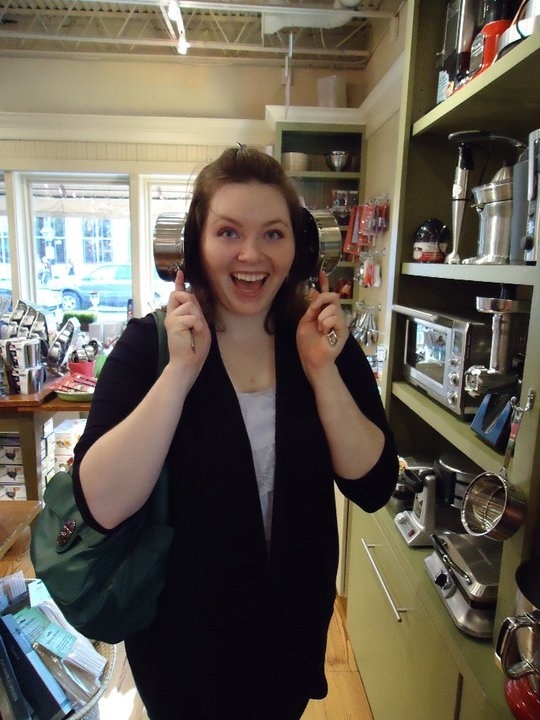 But I’m done rambling on about Crock Pots…I need your thoughts. Once I get my CP back I’ll be sure to whip up some special stuff, like BBQ Pulled Chicken and my Black Bean Sweet Potato tacos! Have you ever used a Crock Pot before? Do you have a favorite recipe? 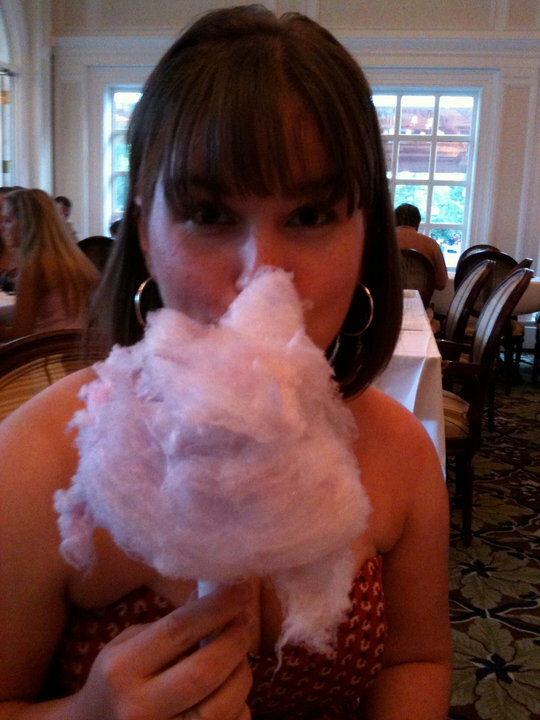 today I’m joining Brittany in her observance of Salubrious September with a post about healthy eating and dealing with cravings. You know from this post that I’ve been trying over the past year or so to eat healthier. Whether I like it or not, I’m heading into my mid-twenties (Brittany, no comments from you. You’re only a year younger!). Unfortunately, diabetes and obesity also run in my family. So I have to be very careful about that. Since I’ve started cooking more and making healthier choices, I have mostly lost my taste for fast food and actually prefer whole wheat pasta. But I’ll be honest with you, I still have a huge weak spot for soda, ice cream, and Starbucks. Maybe I’ll always want more of these things than I should, or maybe I’ll eventually lose my taste for them as well (my mom swears she really doesn’t crave sugar anymore). 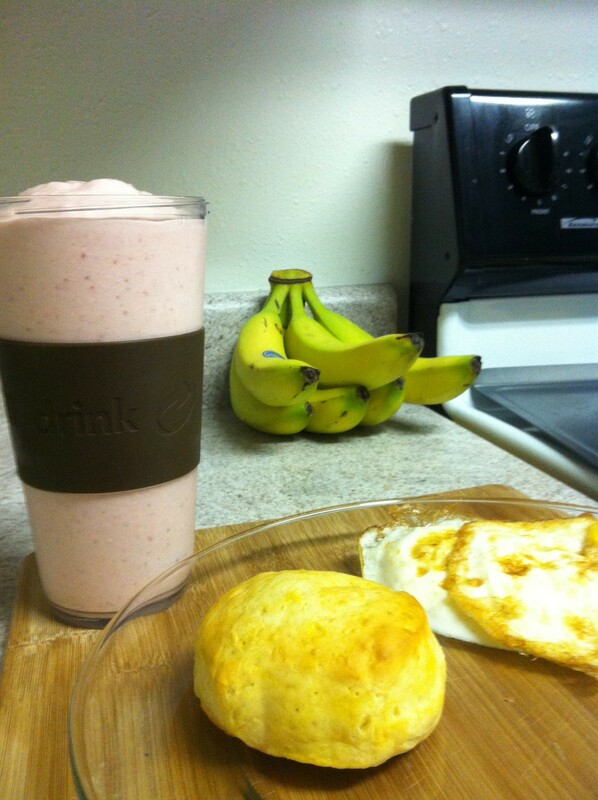 But in the mean time, I have to make sure I’m making healthy choices without depriving myself. It’s important to indulge in your cravings once in awhile or they’ll get out of control. But the rest of the time you just have to say no. Or…you can find healthy substitutes that trick your brain into thinking it got what it wanted. Read on to find out how. I really really love soda. Unfortunately, it’s also really really bad for you. of course, diet soda is an option. But I have a sensitivity to all artificial sweetners except splenda, they give me killer headaches. And really, diet soda isn’t that appealing. 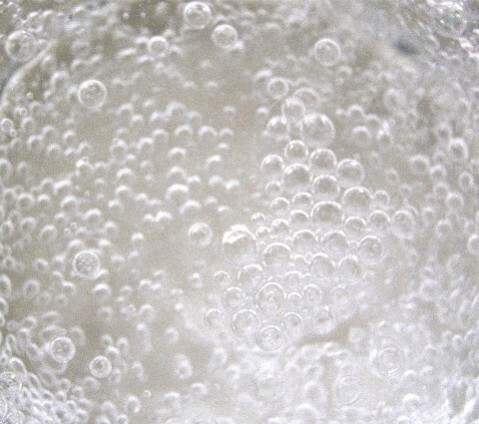 Well I’ve come to realize that while I do like the taste of soda, sometimes its just the bubbles that I crave. So now, if I’m really craving soda I trying drinking ice cold club soda first. Usually, this satisfies my craving and I just saved 150 calories while also getting extra water. Ice cream is my second most common craving. But this one is a little easier to find substitutes for. There are lots of healthier ice cream alternatives out there that are way more delicious than diet soda. 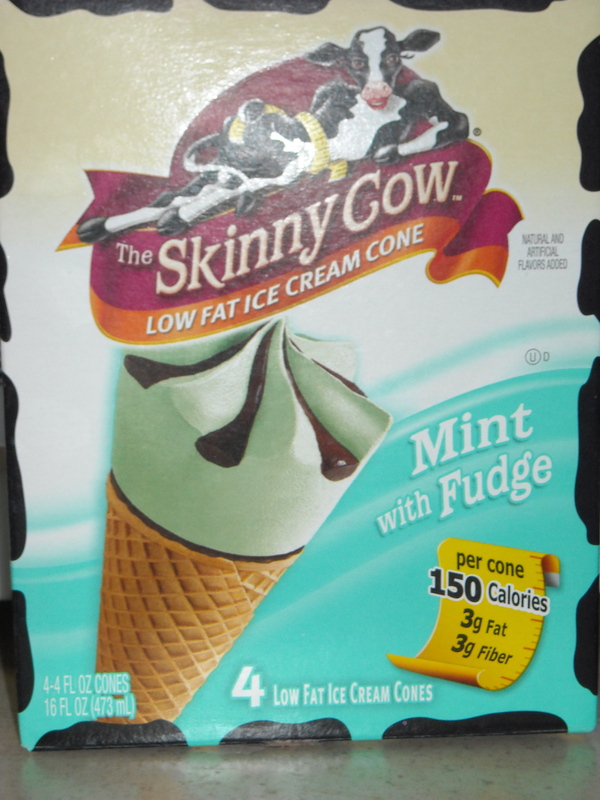 One I highly recommend are Skinny Cow products. I had the ice cream sandwiches a long time ago and remember not liking them very much. But it’s possible that my tastes have since changed or they changed their recipe. Either way, two of their products that I do like and have had recently are the white mint truffle bars and the mint with fudge ice cream cones. The cones are 150 calories and the truffle bars are only 100! As long as you’re not having one every night, these are a perfectly reasonable dessert. And they don’t taste low-cal at all, I promise. Starbucks is a slightly harder craving to satisfy with an alternative. I can’t make drinks like Starbucks does at home, even if I wasn’t worried about the calorie content. But I have found one thing I can make at home that’s slightly lower in calories (not to mention cheaper!). it’s not Starbucks, but it’s pretty darn good. Hot chocolate with cinnamon. Yum! Swiss Miss milk chocolate hot chocolate mix only has 138 calories, as opposed to the 438 calories in a starbucks’ White Chocolate Mocha. 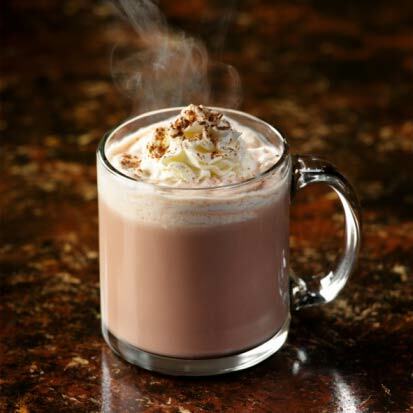 The cinnamon hot chocolate can be made with water or fat free milk and will usually satisfy my Starbucks craving. Question of the night: do you have any healthy substitutes that you reach for when you have a craving for something not so healthy? In my opinion, chicken is one of the most versatile meats. Or poultry, Most Versatile Poultry, if you like. You can dress it up or dress it down, brine it, bake it, fry it, stuff it; the possibilities are endless! Saturday night we whipped up Parmesan chicken (following Giada’s recipe) and made spice cake with cream cheese icing. Talk about a delicious dinner! I didn’t take any photos cause I was too busy chowing down. It was so nice to be able to just relax and hang out with great company! We’re going to try and make it a more regular event. 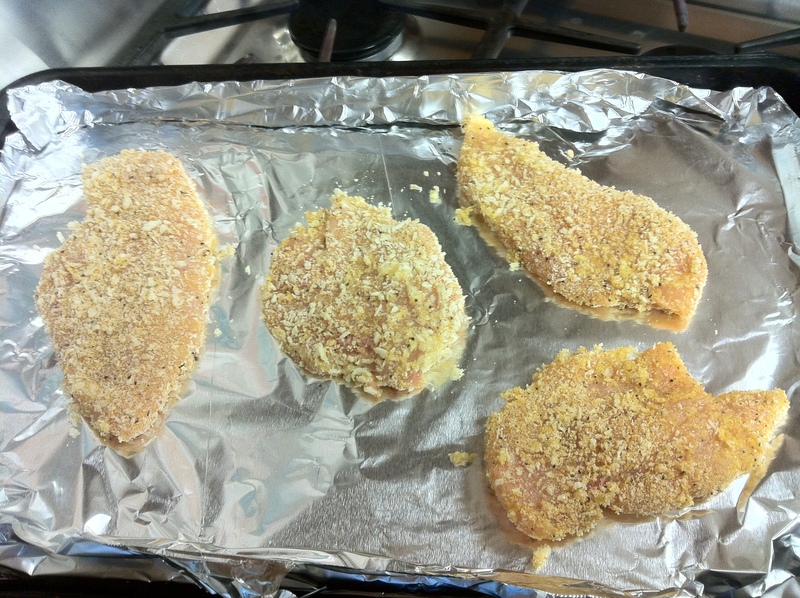 But I digress, the chicken recipe I will be sharing today involves a fantastic ingredient…Panko bread crumbs! We stopped at The Fresh Market and I grabbed some up along with one lovely Meyer Lemon. This is so easy and….you guessed it…versatile! 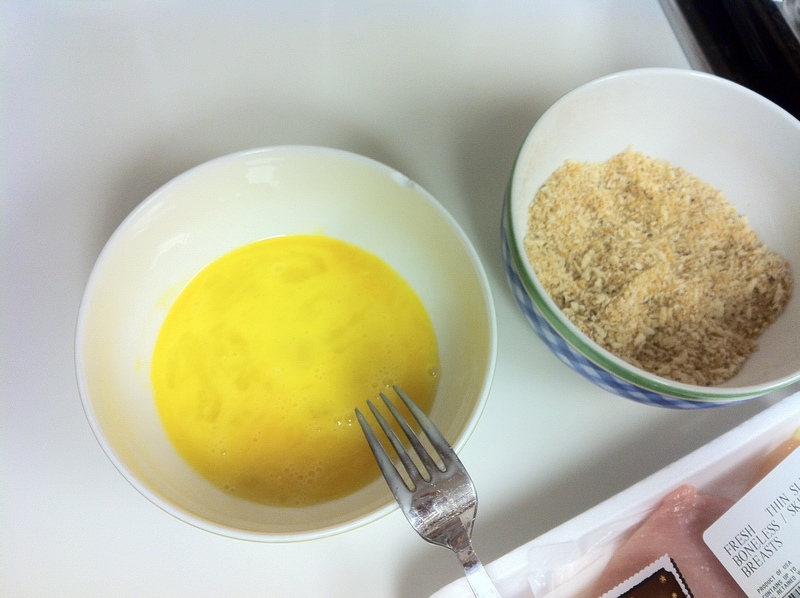 In 1 bowl whisk eggs, in another mix the panko, flax, and saltNpepper. Dip chicken breasts into egg mixture and then put them into the bread crumb bowl and coat. Pop those bad boys in the oven at 350 degrees for 35-40 minutes. 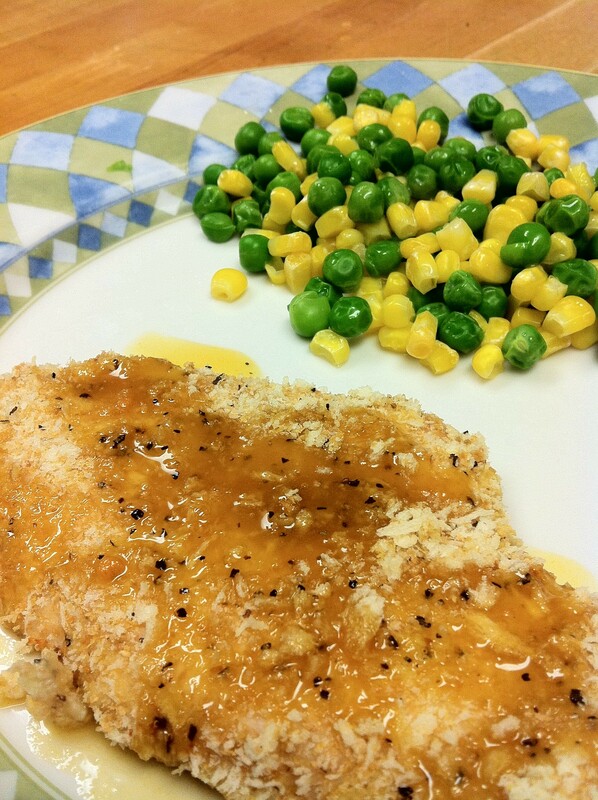 The chicken was juicy and tender….with a little bit of crunch! I’m betting adding garlic powder to the batter would be awesome…I’ll test it out another time. The best thing about this recipe is the versatility (word du jour I’m tellin’ ya!) You can cut the chicken into strips and make chicken tenders, dip in ketchup or mustard, top with marinara and cheese for a twist on chicken parmesan. Or you can do what I did and make this fantastic glaze. 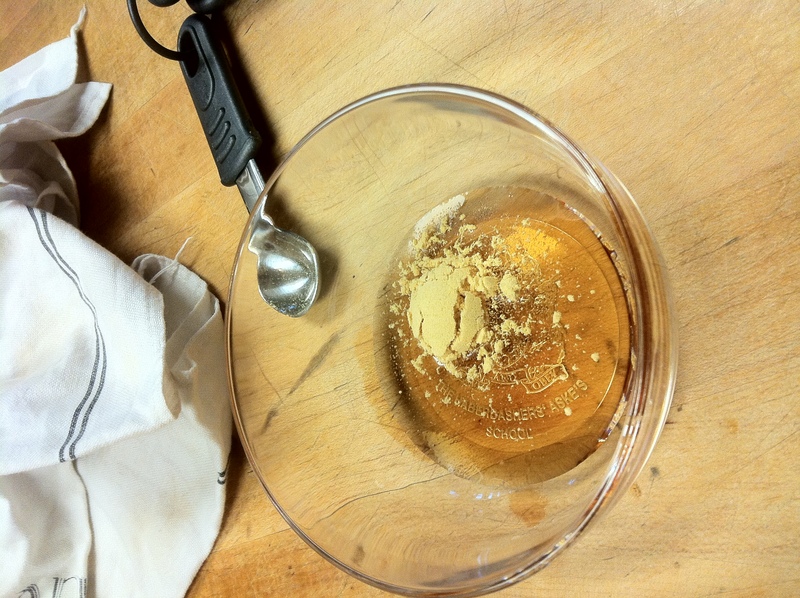 Mix the maple syrup and mustard powder in a small bowl and microwave for 10 seconds (this will help the powder dissolve into the maple syrup) Then add the yellow mustard, lemon juice, salt and pepper. Mix well and drizzle over the chicken. I gobbled mine up with corn and peas on the side…and a little extra glaze. This was a light and healthy meal that was easy and fast to whip up! The glaze starts sweet but definitely has a spicy kick (putting the POW in powder!) Similar to honey mustard, but lacking the floral sweetness that is honey. This glaze is all about feisty flavor, enjoy! And I have 3 more pieces for 3 more meals! I’m all about making enough to have leftovers and figuring out how to revamp leftovers is one of life’s little joys! If you try this recipe, be sure to let me know what you think! What is your favorite poultry? Do you think any others are more versatile than my dearest chicken?